More than half of patients hospitalized for a concussion receive no follow-up care within three months of their discharge, according to a national multi-center study published recently. McGowan Institute for Regenerative Medicine affiliated faculty member David Okonkwo, MD, PhD, is a co-author on the study. 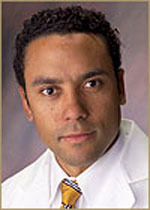 Dr. Okonkwo is Professor and Executive Vice Chair of Neurological Surgery, University of Pittsburgh, with a secondary appointment as Professor of Sports Medicine and Nutrition. He serves as Director of Neurotrauma and of the Scoliosis and Spinal Deformity Program at UPMC. In addition, he is the Clinical Director of the Brain Trauma Research Center. Dr. Okonkwo is also a member of the Medical Staff for the Pittsburgh Steelers. Millions of Americans suffer concussions each year, and many endure symptoms for months or years afterward. But a study of 831 patients sent to top-level trauma centers for a concussion or mild traumatic brain injury (mTBI) found that only 44 percent saw a physician or other provider within three months of their injury, a critical period for care. In addition, only 47 percent received educational materials about their injury before they went home. “One of the goals of this study is to better understand the public health implications and identify gaps in clinical care so we can do a better job of treating patients. “This study should be a siren call to the National Institutes of Health and other federal agencies about the tremendous gap between the public health need and the public health resources that are devoted,” said Dr. Okonkwo. The study was published by JAMA Network Open. Data came from the ongoing Transforming Research and Clinical Knowledge in Traumatic Brain Injury study, or TRACK-TBI. Supported by the National Institute of Neurological Disorders and Stroke, the TRACK-TBI study has collected detailed information, including CT/MRI imaging, blood bio-specimens and detailed clinical outcomes, for more than 2,700 brain injury patients from 18 different U.S. sites. “This finding demonstrates how NINDS’ support for observational clinical research in TBI, such as the TRACK-TBI study, can reveal gaps in patient care, which if corrected, may improve patient outcomes,” said Patrick Bellgowan, PhD, program director at ‎the National Institute of Neurological Disorders and Stroke (NINDS). Most cases of traumatic brain injury are classified as a concussion, or mild traumatic brain injury. However, the term “mild” can be misleading. People can have significant symptoms after concussion, such as migraines, cognitive issues, vision loss, memory loss, emotional distress or personality disorder. “For too many patients, concussion is being treated as a minor injury,” said Geoffrey Manley, MD, PhD, principal investigator of the TRACK-TBI project and co-author on the study. “This is a public health crisis that is being overlooked. “If physicians did not follow up on patients in the emergency department with diabetes and heart disease, there would be accusations of malpractice,” added Dr. Manley, a neurosurgeon at the University of California, San Francisco (UCSF). About 3.2 million to 5.3 million Americans live with long-term health effects of traumatic brain injury, according to the Centers for Disease Control and Prevention. TBI resulted in 2.8 million emergency department visits in 2013. The study estimates that annual direct and indirect costs of these injuries surpass $76 billion. It’s a problem that has hit military members especially hard. Since 2000, nearly 380,000 active-duty service members have had a traumatic brain injury. Most of them are mild cases, according to the U.S. Department of Defense. Concussions have also drawn attention in football, and the high-profile issues have raised awareness of concussions as an important public health problem, Dr. Seabury said. The researchers noted in the paper that persistent symptoms can be debilitating in many ways for patients. They are linked to an increase in medical expenses and — in some cases — job loss, homelessness and incarceration. For the study, USC and UCSF scientists examined data on TRACK-TBI patients ages 18 and older who were enrolled in the study between early 2014 and mid-2016. The data included such medical information as CT scan results, injury characteristics and the patients’ admission score on what’s known as the Glasgow Coma Scale (GCS). They acknowledged some limitations to the study, including that the patients had suffered concussions and, in some cases, may not provide reliable recall of any follow-up care. They also noted the study sites—Level 1 trauma centers that are all affiliated with university hospitals—may not be nationally representative. However, the authors note that these hospitals would typically be expected to do a better job of providing care, suggesting the gaps in follow-up care for a patient in more underserved communities might be even worse than reported here. “The study shows that we need to give patients and doctors the tools to better identify who should be going in for follow-up care,” Dr. Seabury said. Pittsburgh medical centers, including UPMC Sports Medicine, Rehabilitation Medicine and Neurosurgery divisions have been ahead of the curve in severe head injuries for years, Dr. Okonkwo said. “This study opens the door to a much stronger conversation about how to have the quality of care in the Pittsburgh region spread to other areas of the United States,” he said.